Here are some more details about the murderers in the San Bernadino shooting that emerged on Friday and over the weekend. […]Farook traveled to Saudi Arabia for several weeks in 2013 on the Hajj, the annual pilgrimage to Mecca that Muslims are required to take at least once in their lifetime, which didn’t raise red flags, said two government officials. No red flags, because they’re not Christian pro-lifers or conservative Tea Partiers. That would raise red flags with this administration. Tashfeen Malik pledged allegiance to the leader of ISIS just before she and her husband carried out the San Bernardino massacre, law enforcement sources told NBC News. Malik posted a statement of support for Abu Bakr al-Baghdadi on Facebook “just before the attack,” one official familiar with the issue said. Officials said Thursday that Malik underwent and passed a Department of Homeland Security counterterrorism screening as part of the process of getting the K-1 visa. Among the weapons found were three rigged-together pipe bombs at the social service center, each equipped with a remote-control detonating device that apparently malfunctioned; more than 1,600 rounds of ammunition and multiple pipe bombs in the rented SUV where they died; and 12 pipe bombs, tools for making more, and over 3,000 additional rounds of ammunition at a family home in the nearby town of Redlands. […]As part of the complex investigation late Thursday, authorities were trying to piece together a money trail that would have enabled the suspects to acquire over $30,000 worth of guns and explosives. Public records show that Farook made approximately $51,000 per year as an employee of the San Bernardino County Department of Public Health, making it unlikely he could have afforded such an arsenal out of his own pocket. There is no evidence that Malik had a job. So, does this sound like Islamic terrorism to you? If it does, then the Obama administration might have to prosecute you for hate speech. Let’s see what the government thinks this attack was, then we’ll see what they’ll do to you if you disagree with them. Maybe it’s workplace violence, because get off your high horse and stop judging. Remember the Crusades? Yeah, so shut your racist mouth. There was another attack at Fort Hood a while back, and it was proven that the attacker was in contact with Al Qaeda. 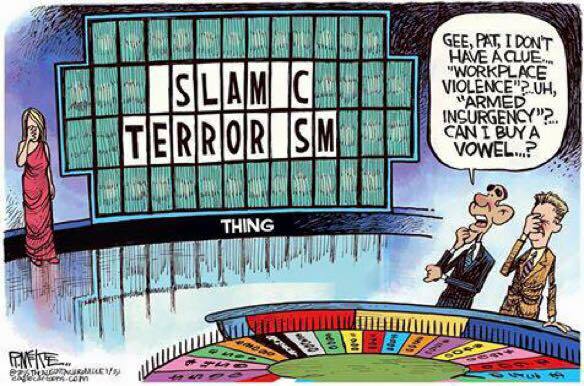 Obama called that one “workplace violence” as well. And then there was beheading by a radical Islamist in Oklahoma, and Obama called that one “workplace violence” as well. And the attack on the recruiting station in Chattanooga, TN was never labeled as terrorism by the Obama administration, either. I could go on and on and on, because we’ve had a lot of attacks by radicalized Muslims under Barack Obama in the last few years, but everything is going to be fine now, because the Democrats have announced a bold new plan to fix everything. So, there is a plan to protect us from these sorts of activities, and it was announced by Obama’s attorney general, Loretta Lynch. Are you ready for the plan? This is the great plan that moral relativists on the secular left are offering to protect us. Are you ready? Speaking to the audience at the Muslim Advocates’ 10th anniversary dinner Thursday, Lynch said her “greatest fear” is the “incredibly disturbing rise of anti-Muslim rhetoric” in America and vowed to prosecute any guilty of what she deemed violence-inspiring speech. “The fear that you have just mentioned is in fact my greatest fear as a prosecutor, as someone who is sworn to the protection of all of the American people, which is that the rhetoric will be accompanied by acts of violence,” she said. […]After touting the numbers of “investigations into acts of anti-Muslim hatred” and “bigoted actions” against Muslims launched by her DOJ, Lynch suggested the Constitution does not protect “actions predicated on violent talk” and pledged to prosecute those responsible for such actions. Obama has his global warming, and Lynch has her “greatest fear”. This is the same woman who declined to charge Lois Lerner for using the IRS as a weapon to persecute conservative groups in an election year. Do you feel safe now? Do you think that the Democrats are serious about the threat of Islamic terrorism? Do you think that you should elect the Democrats again in November 2016? Sound like a large number of people need to remember their general education history of western civilization. Christianity’s early spread was peaceful (on the part of the Christians) but resulted in many of them being killed for their belief. Islam’s early spread was via an army which gave the choice of conversion under duress or execution. The Crusades were the response to defend against the caliphate’s military advances and reclaim what was lost.